If you browse through Whirl‘s November issue with all of their best – prominently animal-based – dish picks, you wouldn’t think that it’s an event that a vegan would be interested in attending. 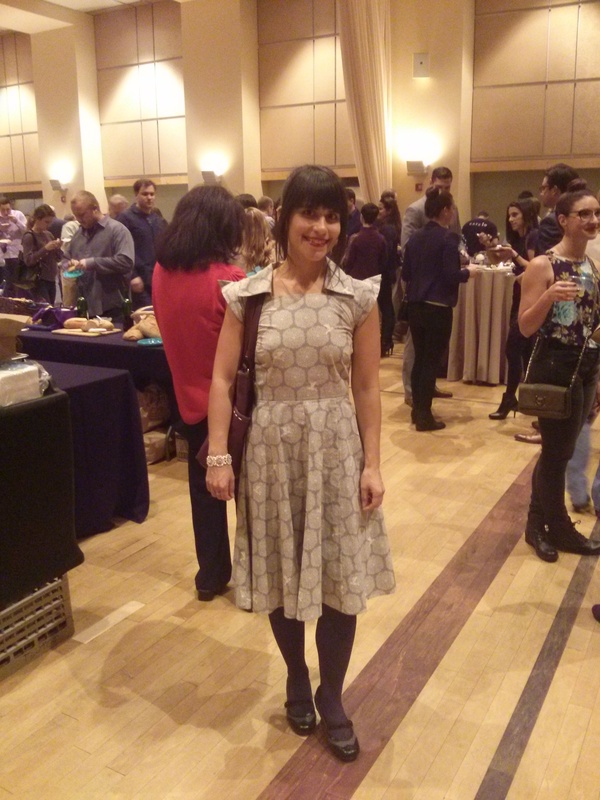 Well this always curious vegan right here got all decked out in her Vaute Couture and headed to the Circuit Center and Ballroom in the South Side to check it out! 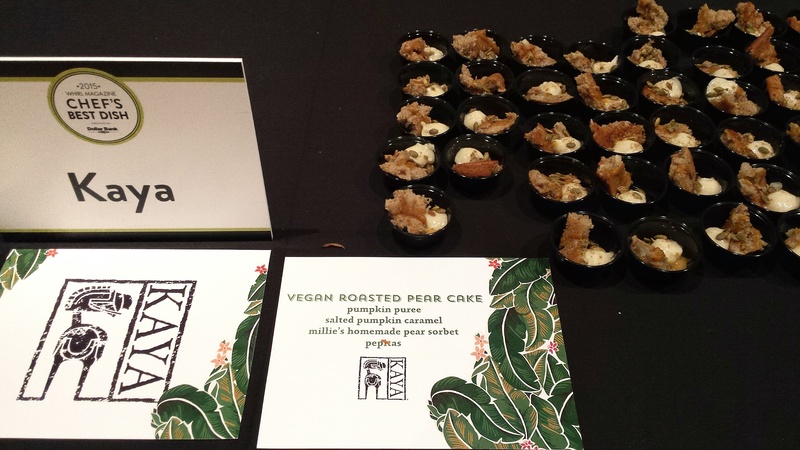 The first table I saw was Kaya‘s…and they had some amazing vegan roasted pear cake with salted pumpkin caramel, pear sorbet, and pepitas. I wanted it all! Their restaurant always has substantial and satisfying vegan choices, and the green curry is a classic among Pittsburgh vegans. I chatted with executive chef Ben Sloan about veganism and he brought up Just Mayo, saying how awesome he thinks Hampton Creek Foods is and how he bought some of their mayo for the restaurant “in Target of all places!”. Way to get out there Hampton Creek Foods! My partner was my date for the night and he spied a coffee booth across from Kaya’s. He has become such a coffee fiend in the past several years, so he practically dragged me over there as I was getting the last bits of the cake into my mouth. Cake and coffee? Yes, please. Christine Tumpson of Whirl Magazine says that Fortunes Coffee is what they have in the office, and at first taste I completely understood her enthusiasm for these beans. 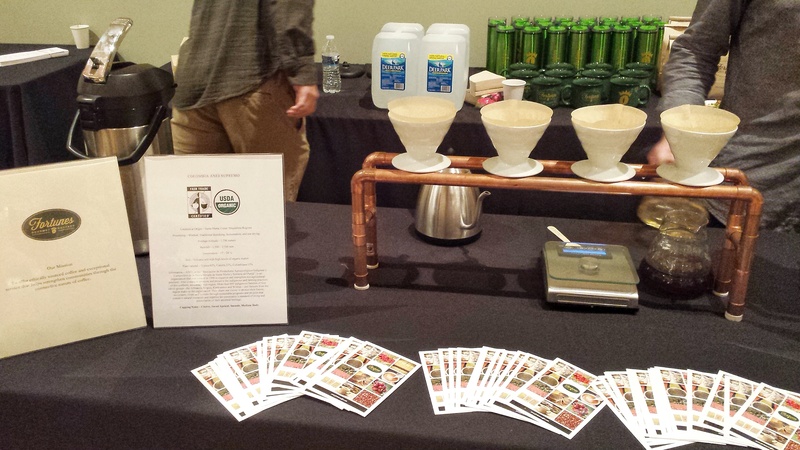 The Ethiopian Yirgacheffe was described as floral, nectarine, full-bodied, and “more tea-like”. I don’t drink coffee often, but still I sit here a week later thinking about buying some of this for an occasional treat. I ran into an old boss from my food service days, and he directed us to a booth where we could get a delicious vegan bite (hold the pork, please). Station is a restaurant in Bloomfield that I hadn’t heard of until now, but I am excited to try it out soon. I was told that with advanced notice, they are more than happy to accommodate those with dietary restrictions and choices (I thank him from the bottom of my heart for using the word “choices” as there is nothing restrictive about veganism!). They have one vegan item on their menu (an apple salad), but many dish components are vegan and can be used to create something special – that means no settling for pasta here! 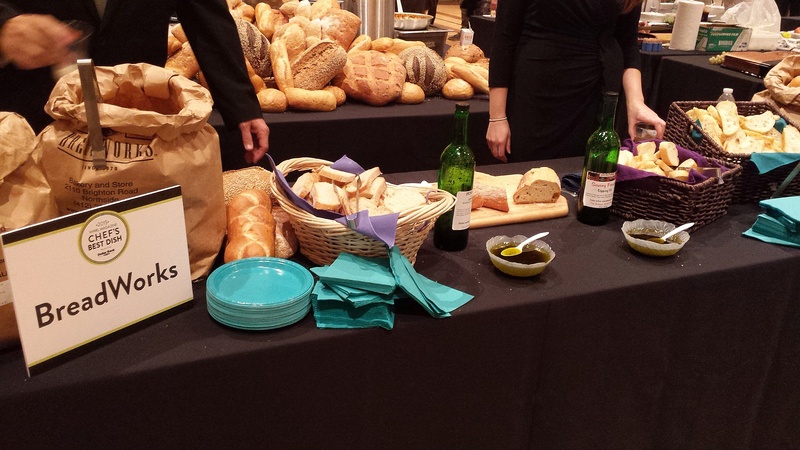 This was my favorite food of the evening. 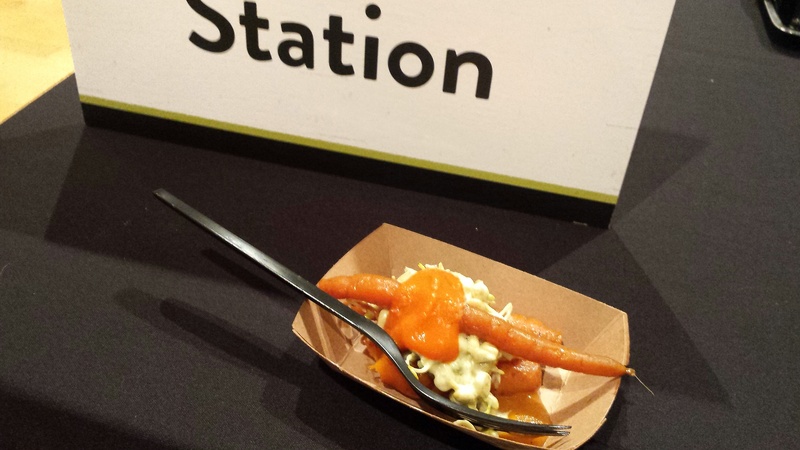 It was barbecued carrots with sprouted lentil salad, cucumber miso dressing, and smoked onion puree. Divine! 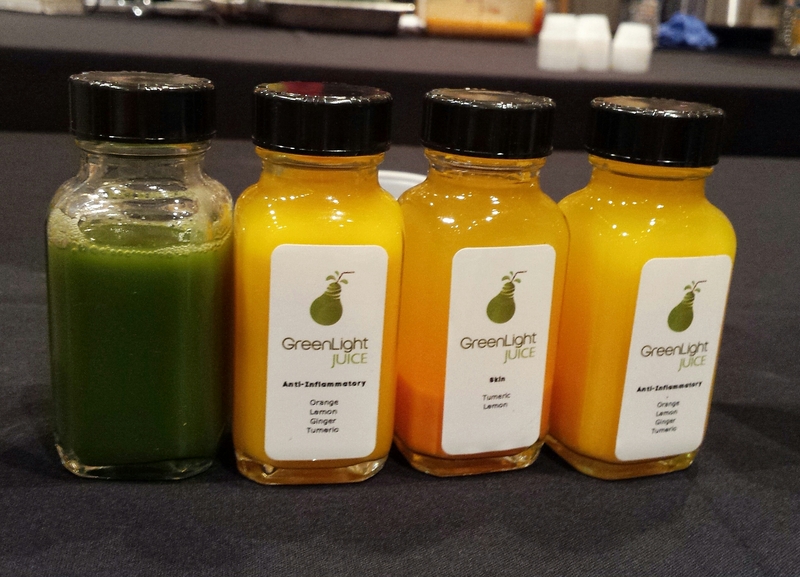 I turned to see GreenLight Juice and recognized them from a new storefront I passed on Murray Avenue recently. 6 weeks young, GreenLight has it going on. 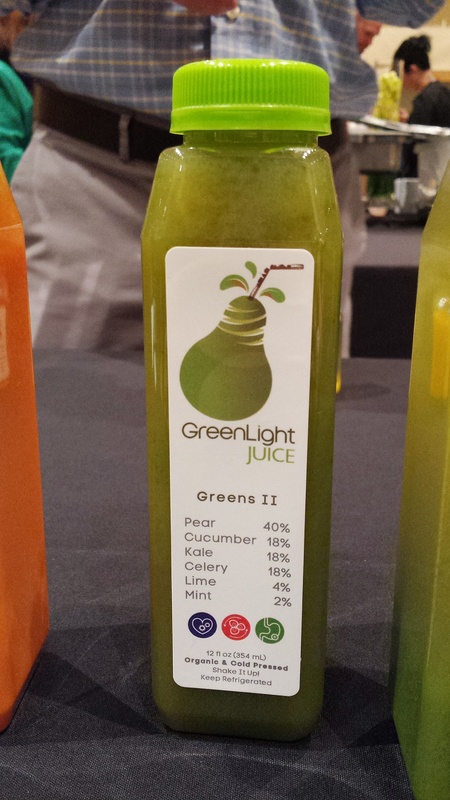 Their Greens II juice is one of the most balanced and refreshingly delightful juices that I’ve had from a juice store. I also loved their Anti-Inflammatory shot with its spicy ginger bite. The Next time I’m in Squirrel Hill, I’m definitely swinging by their storefront for some juice therapy! Breadworks was our next stop. We got a few samples of rolls and slices (all were vegan except for the ciabatta) and drizzled some of the savory french herbed oil on our plates. It was very good. They had a rye bread that they described as “like a pretzel” that I enjoyed most though I brushed the salt off the top just like I’ve always done with soft pretzels. Finally, we went to Alihan’s Mediterranean Cuisine and asked for a plate of roasted vegetables, light salad (onion, pomegranate, sumac, parsley, olive oil), and bread to make a canapé of sorts out of it. None of my pictures came out (still figuring out that taking pictures in dim lighting thing! ), but it was a great last bite…before we stopped to get one last sample of pear cake! What is the verdict from a vegan’s standpoint? While no dish but the cake were completely vegan, I saw such potential for the possibility of vegan items on these chef’s menus. I’ve always noticed that the restaurants who know how to capture and magnify the beauty of plant foods are the ones who would have no problem creating a vegan menu item that diners of all kinds would order time and again. It can be tempting rely on dousing food in some form of dairy, with it’s salty, fatty, addictive allure, but those who find inspiration in nature’s plant foods tend to highlight their culinary talent in a way that mediocre chefs do not. I saw a lot of this talent in the Circuit Center and Ballroom last week. With veganism and more conscious dietary choices on the rise, I see more delectable dining options for us in Pittsburgh’s future!